These are dangerous and unpredictable times. Ten years after the global financial meltdown the world economy still isn’t fixed. After decades of promoting globalisation, which has produced only fortunes for the few and misery for the many, our rulers are beginning to lose their grip. 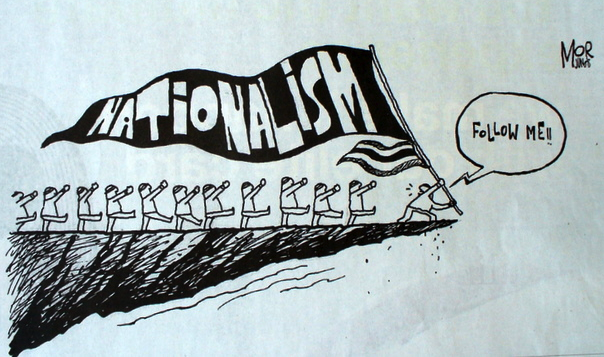 A growing number are turning to so-called nationalist “populism”. Now a new aggression dominates the relations between leading world powers. If they are not fomenting wars or supporting one side or another in conflicts across the planet they are calling for trade wars (via more tariffs and subsidies), an end to migration and competitive currency devaluations in defence of the national capital. This is the sign of a system which lacks real solutions. Wherever you look the “patriot” card is being played more often. Whether it is in the brash version of Trump’s “America First”, or the authoritarian menace of Erdogan and Putin, the game is essentially the same. The aim is to divert attention from the real crisis onto the “other”, the foreigner. The politics of prejudice have always been part of the capitalist game but now the situation is more desperate. Finding a scapegoat is a lot easier than solving the real economic problem. When the USSR collapsed US politicians were euphoric, declaring that a new age of peace and prosperity was at hand. But behind the rhetoric the imperialist determination to defend US interests (and the dollar as the currency of world trade) has brought death and destruction to so many countries across the planet from Iraq and Afghanistan to Libya and Yemen. On the opposite side Putin is trying to throw back the Eastern advance of NATO to Russia’s borders (Ukraine) and hold on to Russia’s one remaining base in the Middle East in Syria. China’s steady build up of its military power has not gone unanswered either. Not content with the 400 bases it already has in the Pacific theatre, the US has used North Korea’s nuclear ambitions as an excuse to deploy the THAAD anti-missile system in South Korea. This won’t save South Korea or Japan from an attack from the North but it will deter a Chinese attack on the USA. The victims of these wars and rivalries are civilians, workers and the dispossessed. They pay the price for all this by being starved and impoverished, gassed and bombed, tortured and raped. Little wonder millions are forced to abandon their homes to seek a precarious refuge where they are not wanted – if they can survive the journey. Imperialist aggression abroad means increased racism at home. The Brexit vote, like the victory of the AK party in the Turkish referendum, or Trump becoming President, have given the green light for bigots and racists everywhere. Attacks on people perceived to be outsiders have escalated dramatically. Some of this has been orchestrated by the state. Under the umbrella of “the war on terror” regimes around the world have a perfect excuse to lock up and murder anyone whose very existence might spoil the official picture of ‘the nation’. It’s not only would-be sultans and tsars who play on the terrorist threat to clamp down on any whiff of dissent. In Britain the tabloid press is notorious for fanning the flames of racist hatred. However, the recent Counter-terrorism and Security Act (2015), announced under a fanfare of the need to “defend British values”, is an altogether more menacing move. This is the latest step in the state’s Prevent programme, begun in 2003 following the invasion of Iraq. Under the aim of stopping people from ‘being drawn into terrorism’, the British state now explicitly sanctions spying-on and hounding of anyone deemed to be different. Teachers, doctors, nurses, social workers and any other professional people are legally bound to actively monitor and report any child they suspect might be “radicalised” in the future. Under Operation Prevent, around sixty children a week (nearly all from Muslim families) are sent on so-called “Channel” courses for re-education: not for any particular crime, but according to someone’s personal impressions. For instance, nursery teachers reported a Syrian refugee child (with almost no English) to the police for constantly drawing planes dropping bombs. Instead of getting trauma counselling for the child the whole family was split up and harshly interrogated by the local police 1 This is encouraging the idea that all Muslims are budding terrorists and stoking the nationalist agenda. In a wider sense it puts the British parliamentary state on a par with any other autocratic regime which rides roughshod over ‘human rights’ to preserve its own security. But our task is not to call for a clean-up of the democratic state or the defence of individual human rights. Our job is to undermine racism by stressing the fact that wage workers throughout the globe are in the same boat. We all share the same interest of getting rid of capitalism, the real cause of mounting insecurity and impoverishment. The working class is a class of migrants and has been throughout capitalist history. Let’s not fall for “nationalist” claptrap or defence of any country. When capitalists call on us to “defend the country” they are really calling on workers to die in defence of their property. “Workers have no country” as Marx wrote in the Communist Manifesto. Whatever other differences we have, we are united as a class by the fact that we are all the exploited victims of capitalism. This makes the working class the international and internationalist class. Collectively it is the only force capable of putting an end to the infernal cycle of crisis and war. Today it’s not so much that we have a world to win – we have a world to save from a system which offers only social and environmental devastation. 1. This short piece was written two weeks before the Manchester Arena atrocity (see http://www.leftcom.org/en/articles/2017-05-23/manchester-arena-atrocity-an-initial-response) and appeared in our bulletin Aurora. For more on how Operation Prevent functions see “Don’t Go to the Doctor” London Review of Books May 18 2017 for more]. Wow Hurra, das ist, was ich Ausflüge für, was für ein Daten! it's new to me. Anyways, I'm definitely delighted I found it and I'll be bookmarking and checking back frequently!